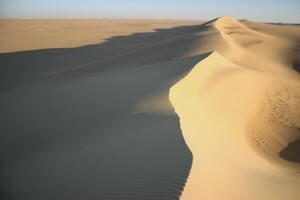 The Great Sand Sea is the pure sandy part of the Western Desert. It is an enormous and in many ways uncharted area, which forms a natural barrier between Egypt and Libya. This monotonous yet fabulous and extremely beautiful area extends from the south of Siwa almost 700 km until it reaches the foot of the Gilf Kebir. From west to east, this impressive sand dune field is about 400 km wide, at its widest point. Some magnificent sand dunes that run in parallel lines reach heights of 100 m and lengths of 100 km. The prevailing winds organise this great sand mass into huge longitudinal crested dunes, stretching uninterrupted for hundreds of kilometres, with smooth sand filled corridors in-between the dunes. This peculiar alignment makes north-south travel very easy among the dunes, but any east-west traverse requires crossing the dunes. The eastern sides are generally steep, while the western sides rise gradually, with pockets of liquid sand. A west to east crossing is relatively easy, but it can be a challenging task in the opposite direction. As with the other deserts, the days can be stiflingly hot and the nights can be freezing cold. While the interior of the area is completely immersed by sand, some outcrops of rock offer a glimpse into the geology of the country below. Some of these outcrops are the most important fossil bearing localities in the whole Western Desert. Just south of Siva there are several outcrops of white Miocene marine sediments, with abundant fossils of hard shelled sea creatures, shark teeth and even a few completely preserved skeletons of dolphin-like cetaceans. The sweet water source of Ain Dalla (Spring of the Shade) has always been a strategic location. It is located less than 200 km from three of the major oases (Siwa, Bahariya and Farafra), the same distance from Kufra in Libya, and lies at the edge of the Great Sand Sea. This makes it a vital desert outpost. Ain Dalla is surrounded on the north and east by cliffs and to the south and west by dunes. Ain Dalla has always been a major port of call for all sorts of people. As the last spring before the Great Sand Sea, used by raiders and smugglers since antiquity, motorized explorers during the 1920s and 1930s, and the Long Range Desert Group in World War 2, it now has an Egyptian army desert patrol that chases smugglers. It is reported that there are several antiquities at Ain Dalla, including two ancient houses, probably from Roman times. Ammonite Hill was formed during the late Cretaceous period. The hill is filled with the fossils of ammonites and marine creatures, now extinct but related to our nautilus. Probably they have been named after the god Amun, whose horns their spiralling shape resembles. Sugar Loaf Hill is a spectacular rock formation, almost halfway between Dakhla and Abu Ballas. Here we find a stele dedicated to the memory of one of the pioneers modern-day explorers: Samir Lama. Regenfeld (Rain Field) is the site where in 1874 explorer Rolf and his colleagues experienced a rain shower, a rare occurrence in the desert. So, Rolf’s team restocked and watered their camels and left a cairn at the place, which he named Regenfeld. The cairn is still there and also a marble tablet set up since 1933 by Almasy in honour of the Egyptian explorer Prince Kamal el Din. Water Mountain Abu Ballas or Father of Pots is situated about 240 km west-south-west from Dakhla, just before the south-eastern tip of the Great Sand Sea. This hill is an ancient water cache strategically located between caravan trails and springs. Hundreds of pots were found around its base. There is rock art too, halfway up the southeast face: a cow suckling its calf, a bearded hunter and its dog chasing an antelope with a bow and arrows, and a man’s profile. Abu Ballas or Pottery Hill is situated about 90 km south-south-west of Mut. This is a water depot, where water was stored in large old pots. Hundreds of pots and amphorae, each able to hold about 30 litres of water, were once found here at the depot. They were heavy. Some were probably thrown on a potter’s wheel. They came two styles: tall, slender, and pointed bottomed as the amphorae from the 18th dynast and tall, fat and round bottomed as those from the later Old Kingdom to the First Intermediate. One hour’s drive beyond Abu Ballas is a field with peculiar wind shaped sculptures, all facing the same way, known as yardangs or mud lions. This area was once an ancient lake. After the lake was fallen dry, the fauna left fossilized as red sedimentary rock. Time and erosion has shaped these rocks into what looks like basking sea lions. A sweeping dune forms now the backdrop to curious and unexpected scene in this remote landscape. The so-called Selima Sand Sheet is a monotonous 300 km flat, fine sand covered area, broken only by wide separated dune fields and giant ripples. It straddles the border between southwest Egypt and northwest Sudan and is named after the Selima Oasis on its eastern border. The solid rock is everywhere covered with a uniform sheet of wind-blown sand. On the southern shore of the Great Sand Sea, close to the Libyan border, we find one of the great mysteries of Egypt: the Silica Glass Fields. The silica glass is concentrated in two areas. One area is oval-shaped; the other is a circular ring, 6 km wide and 21 km in diameter. These fields don’t contain just ordinary glass, but marvellously ultra-pure yellow-green glass of 98 per cent silica. Tiny pebbles as well chinks weighting up to ten pounds, vary in clarity and colour, can be found half buried in the reddish sand, its upper surface polished by the incessant winds. Silica glass, as pure as it is, does contain tiny bubbles, white wisps and inky black swirls. The whitish inclusions consist of refractory minerals such as cristobalite. The ink-like swirls, though, are rich in iridium. The exact origin of the glass is still unknown. A plausible theory suggests that the sand was fused by the intense heat of a meteor impact. The Kebira Crater near the silica glass field should be the proof for this theory. Another theory states that a super-saturated lake of silica slowly dried into pure natural glass. Fact is that this glass has been used in the past to make knives and sharp-edged tools as well as other objects. A carved scarab of silica glass was found in Tutankhamen’s tomb, indicating that the glass was sometimes used for jewellery. Big Cairn is a major landmark at the western edge of the great sand Sea, set up by Patrick Clayton in 1932, after his first east west crossing of the sand sea from Ain Dalla. Bir Russi or Russian Spring is located about 150 km south from Siwa. Its name implies it must have been Russian engineers who drilled this well during the seventies. It can only be accessed by driving through the high dunes of the Great Sand Sea. A little artificial oasis sprung up beside the drilled well. From the hue dunes that surround this well, you have the most significant views of the incredibly beautiful area.